According to a recent Fast Company article on the future of work, soon people will put in 80 hours a week just for the dubious privilege of having a job. These are the positions that won’t be eliminated by robots, automation, and intelligent algorithms. The jobs that are most safe going forward naturally require skills referred to as the “three bottlenecks to automation:” creativity, social intelligence, and the ability to interact with complex objects and environments. As a result, fewer people will have traditional jobs, and they’ll likely be paid well and worked to death. The people who will be able to land these jobs will also be the most capable of succeeding outside of traditional employment. Which would you choose? 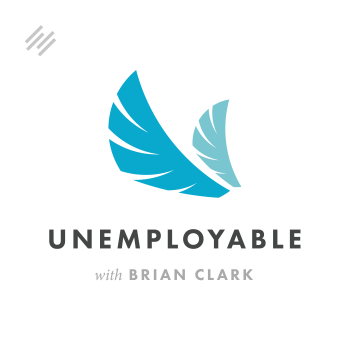 Brian Clark: Welcome everyone to episode 3 of Unemployable. I’m Brian Clark, and today we’re talking about the unique skill set and character traits that allows freelancers and entrepreneurs of every kind to survive and thrive. To be clear, this discussion isn’t about convincing anyone to quit their job. This show is aimed at people who are already on their own in some fashion. If you’re still holding down a job and want my advice on whether or not you should quit … I’d say if you actually do quit, then you made the right choice. You’re not going to stay no matter what if you’re what we call psychologically unemployable. But remember that we talked about a different concept as well in episode 1, and that’s becoming technologically unemployable. Basically, robots, automation, and intelligent algorithms will eliminate a bunch of jobs beginning in the next five years, and then accelerating into the future. The interesting this is this … those most qualified to be on their own are also the people that robots and computers can’t replace. Which presents a fascinating scenario. You know, there’s a joke that says an entrepreneur is a person who works 80 hours a week to avoid working 40 hours a week for someone else. According to a recent Fast Company article on the future of work, in the future you’ll work 80 hours a week just for the dubious privilege of having a job. Those remaining jobs will resemble current positions in the tech and finance world. High salary, lots of on-site perks like meals and massages, all designed to keep you working as many hours as humanly possible. Good times. As I said, the people who will be able to land these jobs will also be the most capable of succeeding outside of traditional employment. Which would you choose? I know the answer for me, and I’m betting it’s the same for you. Which brings up another interesting question. Assumptions are that it will be the companies that shed employees in favor of automation, and that this will be a huge disruption in the workforce. And that’s correct. But the bigger issue is, will the remaining people with desirable skill sets actually accept employment any longer? I mean, we know job security is an illusion, so what’s the point? Wouldn’t the contract and “free agent” models used in sports, film, and television make more sense when true talent is in high demand? A recent article in the New York Times suggests so, but the idea started 15 years ago with Dan Pink’s book Free Agent Nation. It may well be that the talent drives this aspect of the disruption to traditional employment, not the employers. It’s just another gig for an in-demand worker. The idea is interesting to consider, and we’ll talk about it more in the future. Beyond what we’ve covered, there’s another unique and crucial characteristic that separates people from the algorithms, and even from our primate cousins with whom we share most of our DNA. Machines and other primates can learn, but they can’t ask why. There’s a great book by Ian Leslie called Curious: The Desire to Know and Why Your Future Depends On It, and Leslie maintains that it’s curiosity that is the definitive trait that propels humanity forward in general. And it’s an innate state of curiosity that powers the most innovative and in-demand human prospects, both in the corporate and entrepreneurial world. I like that … I like that a lot. Another way of saying that is there is a rising premium on people with a high “need for cognition.” Need for cognition, or NFC, is a scientific measure of intellectual curiosity. Guess what … this is exactly what drives the entrepreneurial spirit as well. I’ll leave you with this. After my first success with my second company, my whole worldview shifted. Suddenly I saw opportunity everywhere, and it was fueled by this intense curiosity about different business and revenue models. How does that company make money? What are the profit margins involved? Which processes do they use for efficiency? And most importantly, what about my unique skill set can provide me with an entry into old industries with new, disruptive approaches? That’s a lot to unpack right there, and we’ll do just that in future episodes. Check out the show notes for links to further reading on the things mentioned in this episode. That’s all for now … thanks for listening, and as always … keep going.